Whew! That was close. Meldwyn pulls up just in time to avoid a stump that wasn’t even gonna budge if he hit it. He would have had a lot of explaining to do, if he had survived. Fortunately for our story, he’s righted the ship and the near miss falls into the no harm, no foul category. As he rises back into the canopy, he gets that pleasant feeling he’s experienced when he’s consumed too many popsicles and drunk too much ginsing tea and sees Lucinda from his building hanging her lingerie on her balconythat kinda buzzy post adrenaline flush that focuses the mind in a cool, kind of loopy, zen way. 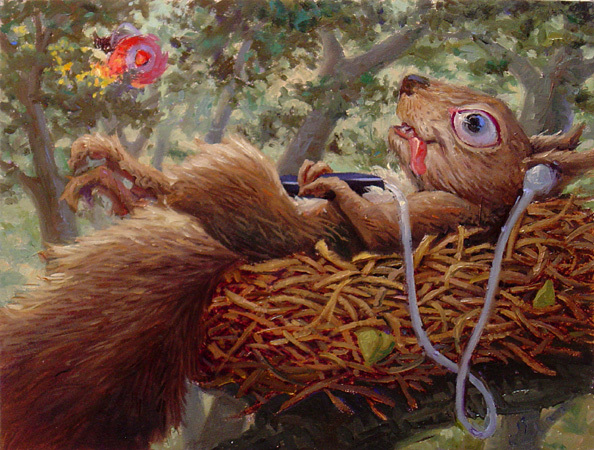 Meanwhile, back in the nest that Karfka the psycho squirrel has stolen from another of the forests treetop denizens, the savage beast would seem to be in the process of being tamed. It seems that he has actually found something on Meldwyn’s ipod that he can get into. Karfka is chillin to Meldwyn’s stash of music by the alt-classical band Rachel’s. He finds that it clears his mind, allowing for free associations which lead to creative (and of course demented) scenarios for taking over the world. That music so beautiful can lead to such depravity seems incongruous and wrong until one realizes that Stalin spent a great deal of time at the ballet and that history’s most notorious despots have had some of the worlds great art collections. Oh well, you expect the world to make sense? Lost in his musically induced delusions, Karfka doesn’t hear the growing whoosh and roar coming his way through the treetops.